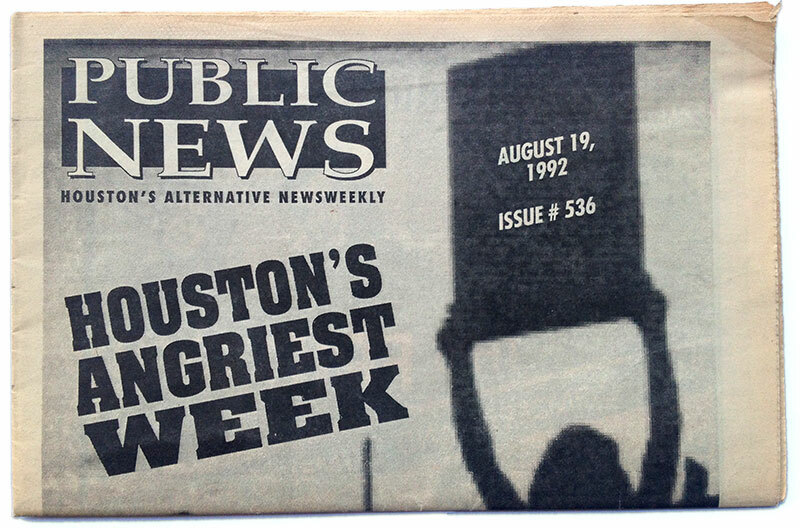 From 1990 to 1992, I worked part-time at Public News, a weekly 47,000-circulation newspaper that served the inner loop of Houston. It was a heady and rambunctious operation – production was done on Tuesday night and the entire weekly was assembled on wax within a few hours. I served as an “office assistant” which quickly became “production” and the “driver” – as I was the only one on staff that had a reliable vehicle (an the insomnia) to drive it all the way to the printer in Texas City. I ended my work there as an Editorial Assistant. Public News was affiliated with the Alternative Weekly Network [AWN], a non-profit that helped place national ads in about 100 affiliated alternative papers across the country.